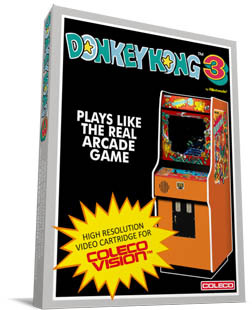 I wonder if Eduardo has any interest in getting this 1983 DK installment done for the ColecoVision/ADAM, seeing that it's the least known of the original trio behind the original 1981 Donkey Kong and its 1982 sequel Donkey Kong, Jr.? You are Stanley, a gardener. Bugs of all types invade your garden, as DK scratches the beehives at the start of every board. Stanley must either spray DK all the way up (don't let him fall down or you lose a life), or spray all the bugs DK throws out at you from the beehives, to win each and every board. Coleco had plans to release DK3 to the ColecoVision in 1984 (going by its entry in the ColecoVision FAQ under "Unreleased Games"), but it was scrapped because of the video game crash of '83 and because of Coleco's setback with Atari and Nintendo over a primordial version of the original DK to be released for the forthcoming ADAM computer system (at the 1983 Summer CES convention). Edited by ColecoFan1981, Thu Apr 5, 2012 7:50 PM. Does anyone really care about DK3? AFAIK it isn't that popular. Besides, my arcade todo list is already full. For any new game to get it, some other must get out. Admittedly no, but I think it's a pretty good. 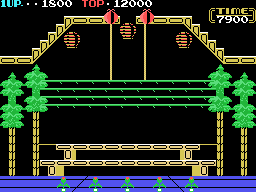 The trick is to think of it as a Galaxian shooter rather than a "Donkey Kong" game. But yeah if you're list is full I say focus on what you're doing already.. I like your choices of games so far. Ok, probably my first sentence sounded a little rude. That wasn't my intention though, so I apologize. Thing is, I have an expiration date, just like everybody else. As much as I would love to port every single classic arcade game out there, that isn't really possible. So I compiled this list with 16 arcade games that I hope to be able to port some day. The list was totally based on personal preference. Obviously I cannot make everybody happy, but if I am not happy, then chances are that I am not going to finish whatever port I start. Unfortunately DK3 isn't a personal favorite (that is what I should have said in my first post). So it isn't in my list. But as J-F just posted, he is going to take care of that, so in the end everybody will get happy. Edited by opcode, Thu Apr 5, 2012 9:03 PM. 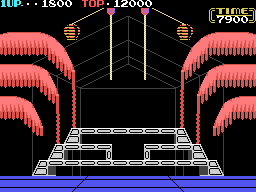 It's not my intention to cause controversy here, ColecoFan1981, but a short while ago you asked about Circus Charlie on the CV, and you were told that the game had already been released, under my Team Pixelboy label. Since then, nothing, as far as I know. Somehow I expected you to try to purchase a copy since you seemed genuinely interested. So I have to ask, because now you're enquiring about Donkey Kong 3. Are you just poking on the heads of homebrewers with no intention of actually purchasing a copy, if DK3 was actually released one day on the CV? 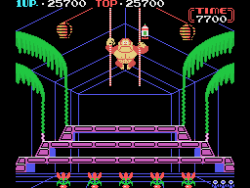 You have my support and vote to produce Donkey Kong 3 for CV, and i hope it DOES get made eventually like mentioned above, i'd buy in an instant! Edited by Rik, Sat Sep 29, 2012 11:51 PM. Wasting my life...one Shatner at a time. I would buy this in a heartbeat! I play it often on NES, but it would be great on the CV. Well, if it's going to be a SGM thingie, I guess I won't be getting it then. No offense, but I can't justify the doubling-up on costs to get game like that... might as well get the NES version at that point. What inquiring minds really want to know is if ColecoFan1981 ever bought Circus Charlie from Team PixelBoy? Nope. Not from me directly anyhow. If he did, he bought it from Good Deal Games. It is not really doubling up though if you get the SGM for the ability to get the huge amount of games that are being produced for it. Then oh you already have it when Donkey Kong 3 comes out. Somehow, I doubt it... but as the old saying goes, "too each his own". Ah I see what you mean by doubling up. You already have it for NES. Yeah I guess that is true. I only care about colecovision and have only owned a colecovision. So since I have no other systems I am happy to buy whatever is produced because otherwise I can't play it. Not sure where you got the idea that we are turning the CV into an NES. We will be releasing a few games in common yes, but the CV+SGM is still a CV, just with more memory added and double of sound channels. I guess that when I see all the samples, etc., that's been put out, it screams "NES" rather than an expanded CV, with the new lettering, NES-like screens, and so on. I guess for me that somehow it loses the CV appeal by looking too 'modern' for what it's supposed to be. But I admit that I'm strange about my nostalgia fixes.